Black comic conventions, pioneered by "Black Age of Comics" creator Turtel Onli, have been foundational in establishing an active community around Black comics. Annual conventions for creators and fans, already an accepted cultural practice of the comics world (San Diego's Comic-Con attracts an annual audience of more than 130,000) are an important mainstay of the comics community. Turtel Onli organized the first "Black Age of Comics" convention in Chicago in 1993. Onli's annual Chicago event has since been joined by the East Coast Black Age of Comics Convention (ECBACC) held annually in Philadelphia. ECBACC is dedicated to people of African descent creating a plethora of Black characters in the comic book industry. ECBACC affords artists, fans and comic enthusiasts a vehicle to connect with, network and experience the full range of Black creativity and culture within an industry that has historically presented challenges for people of color, whether it be the portrayal of Black characters or the ability for Black artists to find employment within and across the industry. This year, the annual ECBACC was held on May 21st at The Enterprise Center in Philadelphia, with The Glyph Comic Awards being presented at the convention on May 20th. The Glyph Comic Awards recognize the best in comics, made by, for and about people of color. According to Comic Book Resources, Chuck Collins's webcomic Bounce, a gag comic about two New York bouncers, earned three awards: Best Comic Strip or Webcomic, Rising Star Award, and Fan Award for Best Work. The Story of the Year award went to Revelation: Brotherman - Dictator of Discipline, by writer Guy A. Sims and artist Dawud Anyabwile, and Anyabwile picked up the Best Artist award for that comic as well. As the comics industry continues to make a noticeable shift towards including, marketing to and creating safe spaces for women and women of color, nominations for comic awards across the industry have soared. The Washington Post reported a record number of 2016 Eisner Award (The 'Oscars' of Comics) nominations for women this year. Still, woman of color continue to struggle to be recognized for their work in the industry. The first time a Black woman ever won an Eisner Award at San Diego Comic-Con was in 2014. This year women were well represented across the Glyph Awards as well. One notable Glyph Award winner was writer, Juliana "Jewels" Smith for her self-published 4-volume comic, (H)afrocentric, which took home the Best Writer Glyph Award. 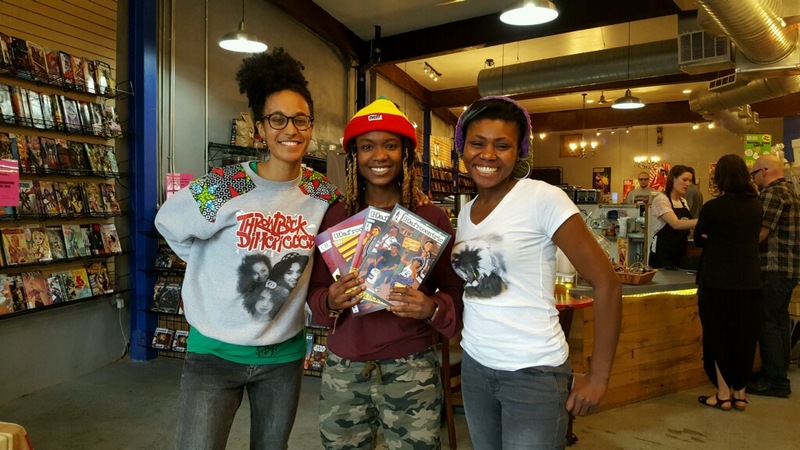 Juliana "Jewels" Smith held a book signing at Amalgam Comics in Philadelphia, which is the first and only Black female owned comic shop on the East Coast. When first reading (H)afrocentric, I immediately connected with, not only the characters, but the writing. (H)afrocentric is the void Aaron McGruder's The Boondocks left in the early 2000s, when it made the transition from witty, socially conscious comic strip to animated cartoon - which leaned more towards blatant and egregious homophobia and sexism. (H)afrocentric gives the reader wit, commentary on current complex social issues and humor, whilst portraying a gender-diverse cast of young, educated millennials. As Black millennials graduate college at record highs, as gentrification across American cities continues to exhibit racial inequality, as the United States population experiences major demographic shifts, (H)afrocentric is timely as it grapples with all of these issues and then some. In writing my dissertation at Howard University on The Boondocks comic strip, I describe the strip as a "cultural icon", due to its impact, crossover appeal and Black cultural sensibilities within the newspaper - a historically whitewashed medium when it comes to comic strips. However, the strip fell short when it came to gender representation. Women (particularly Black women) were rarely, if ever, seen or heard, and when they were, it was often against the backdrop of a joke. Where The Boondocks left readers like me wondering if Black women had any place in Huey's (the main character) vision around disrupting racial injustice, challenging the status quo and reflecting on the plight of the African-American community, (H)afrocentric's writer , Juliana "Jewels" Smith gives us a variety of gender diverse and ethnically diverse characters with divergent, yet intersecting ideologies. For example, Naima Pepper, is a radical Black feminist, Miles Pepper, is an apolitical musician, El Ramirez is a Chicano nationalist and Renee Aanjay Brown has a political pulse around gender and sexuality but lacks much in the way of racial politics. This makes for a robust cultural and critical critique of social, economic and cultural issues whilst providing the space for humorous commentary. (H)afrocentric may be considered the feminist version of Aaron McGruder's, The Boondocks, yet it offers something, ideologically, for every type of reader. (H)afrocentric can be previewed and purchased here. You can also find (H)afrocentric on Twitter: @Hafrocentric.